The winner of the UK Pool & Spa Awards’ Spa Product Of The Year, the SaniStreamTM Direct Line Filtration system is a high quality Darlly hot tub filter, combined with an adjustable and refillable chlorine or bromine tablet erosion feeder, called SpaPodTM, to make a highly-effective combined, integrated hot tub water treatment system. The story of SaniStreamTM goes back 18 months to when Darlly Europe directors Phil Moseley and Gil Gingell were pondering the issue of the then, recently published, health and safety guidelines, HSG282. HSG282 was ruffling many feathers in the holiday let and hot tub sectors alike due to a particular section relating to disinfectant dosing. 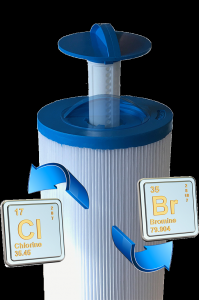 Section 76 of HSG282 states that hot tubs installed in a setting where used ‘… as part of a business activity (eg in a holiday park rental unit or hotel bedrooms with their own dedicated spa, or as part of a rental agreement for a single family or group use)’ must be ‘disinfected using bromine or chlorine through the use of an inline disinfectant feeder’. The major stumbling block with Sec. 76 is that few hot tubs sold on the UK market feature inline disinfectant feeders. A proprietary after-market chemical feeder is potentially expensive and involves modifying the hot tub’s pipework, possibly voiding the spa’s warranty. The feeder also needs to be located somewhere where the consumer can’t easily access it, but a technician can. Worse still, HSG282 made no legacy-exemption provision, meaning many thousands of hot tubs already in the field became non-compliant overnight. Given the hugely positive market feedback, Phil Moseley and Gil Gingell of Darlly Europe, made the decision to go ahead with tooling and production. They said: “The investment in R&D and tooling costs have been, to say the least, eye-watering, as we had to produce versions to suit all the most popular filters in the market, but we have huge faith in the concept and the product.” Production models in their numerous variations have been rigorously tested in many hot tub brands and models over the last year, including in holiday let settings, with excellent results all-round. The SaniStreamTM system has proven easy to use, and extremely effective. The product’s main launch will take place at the forthcoming Spatex 2019 expo and Phil and Gil are excitedly looking forward to the event. It also coincides with the launch of a pre-filled disposable bromine version by CPC, the AquaSPArkle Bromine Pod, in a joint project with Darlly; and news that SaniStreamTM is to be included as standard equipment in all Elite Spas hot tubs for the 2019 season.